This will not be a quick build as workshop time is limited, I've already been pecking away at this for over a month to get to where I am today. For a while now I have had the urge to build a 3d printer, reading around and doing a bit of research I decided on a "CoreXY" style. 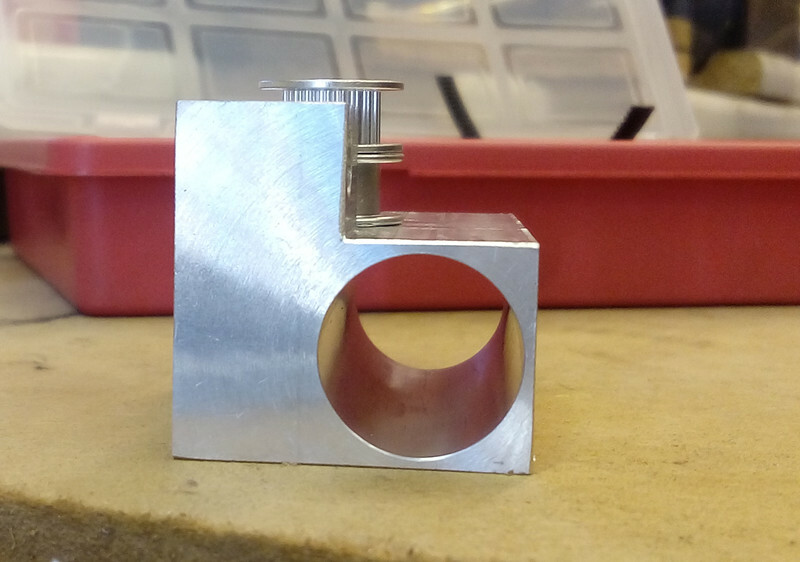 So the basics of this style is to create a box frame to which the linear bearings and everything else are attached. 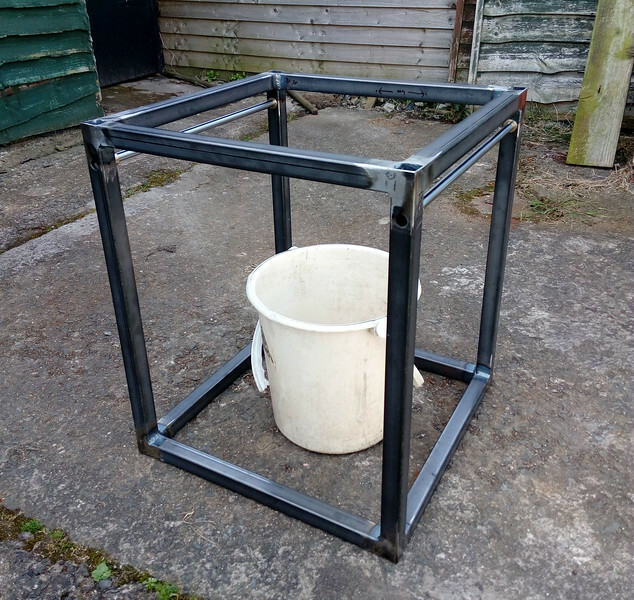 So a few weeks ago I started by deciding on the outside dimensions, 425mm x 425mm x 500mm high, with the plan that (hopefully) I will end up with a Print capacity of about a 300mm cube. Over a year ago I had thought about building a 3d printer and had ordered some 400mm x 8mm rods and a bunch of 8mm linear bearings. 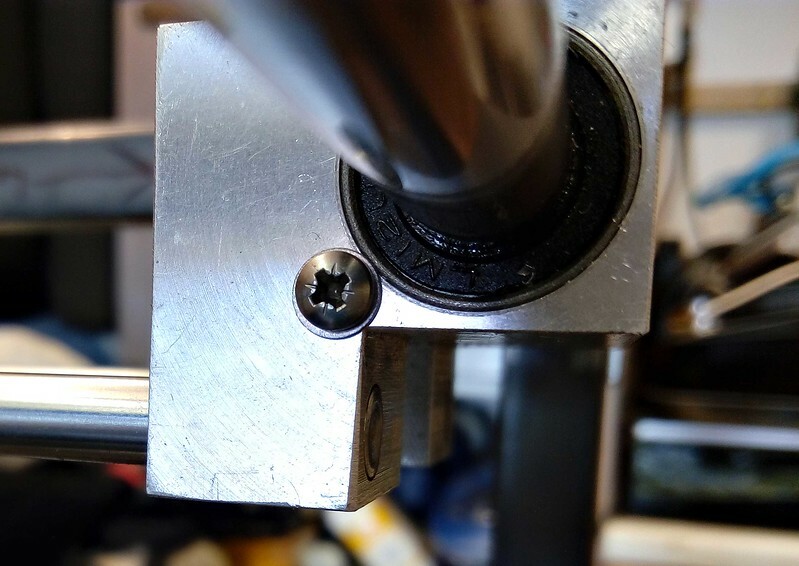 In my research I found that many found the 8mm rods flex on larger printers, so that made me experiment with deflection and I found that I got about 0.4-0.8 mm deflection on a single 8mm rod with a highly specified weight in the centre (a box of coach bolts). So I got some 12mm rods and linear bearings for the Y axis. I plan on using 3 8mm rods for the X-axis in a "L" configuration, that should minimise deflection. I have no fancy 3d renderings of what I am building, so that's another reason why this will be a longer build, I will be spending plenty of time thinking before hacking up metal. So a little more on the design (such as it is). I had a few lengths of 25mm box section steel just lying around waiting to be used, so I cut 8x 375mm lengths for the stretchers top and bottom, and cut 4x 500mm lengths for the 4 uprights. I then set up a vice-stop on the mill and drilled & reamed a 8mm hole through, centered 50mm from one end in each upright. Then I drilled out one side of the 8mm hole to 16mm and then cleaned up the drilled hole with a boring bar to ensure a truly round hole (ended up being about 16.2mm) This was done so that when the whole box was assembled I would have a means of adjusting both the Y-axis bars to get them parallel and flat in relation to each other. I figured I would make bushes for these holes that could be have offset holes in them to carry the Y-axis bars. 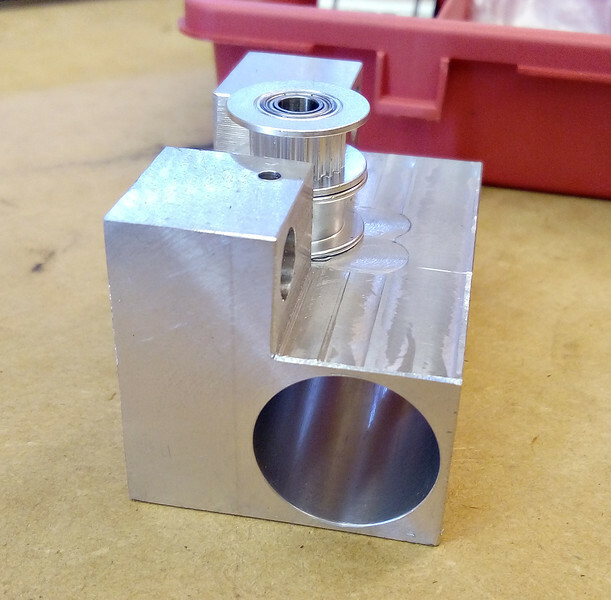 It was at this point that I realised that I would need a way of inserting the 12mm Y-axis bars through the frame, so I enlarged 2 of the 8mm holes in the uprights to 12mm. 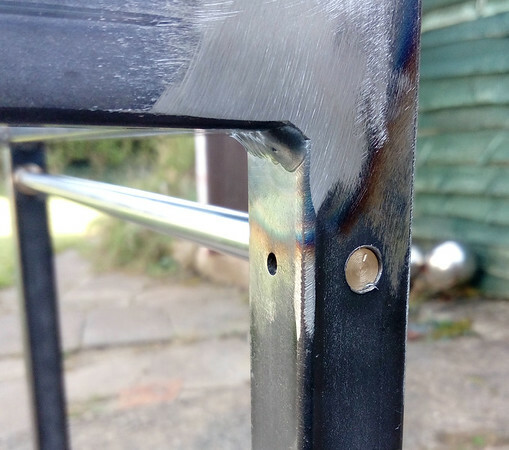 Then I started to weld up all the stretchers and uprights (after carefully marking each, and also drilling a few M5 holes for potential future use), this called for some thought as the process of welding introduces many stresses and it is remarkable how much it will pull and move parts. 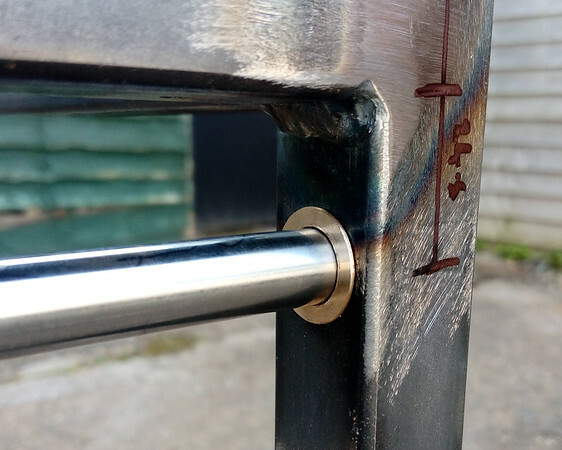 I ended up by tack welding only the very outside corners, making 2 sides and then carefully tacked on the stretchers to join the 2 sides into a cube. 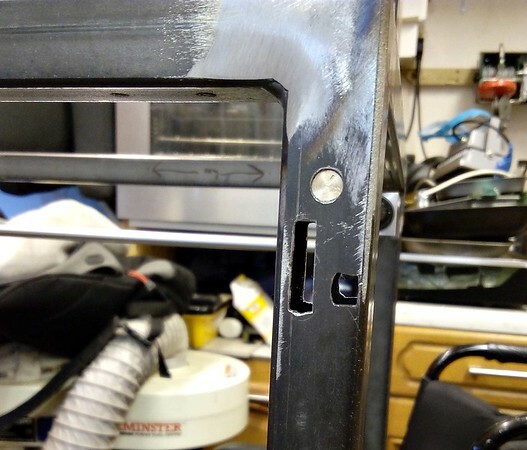 Then I followed a painstaking process of checking every corner with my 9" engineers square, finding the worst out-of-square culprit and placing a tack weld in the right place to pull it back into square. (it was really surprising how much the metal moves as it cools) Then I would wait until it had cooled before moving onto the next one. Lather, rinse and repeat....... This took quite a few sessions, but was really worth it to get a cubic frame that was less than 1mm out of square in any axis. Today I started thinking about making sure that the 2 bars were absolutely parallel and also flat with relation to each other. I previously was trying to get them running true in the same plane as the top of the frame, but I realised that the frame has a slight rock to it (about 0.7mm), so it struck me that the most important thing is to get both Y-axis bars true and parallel to each other, everything else can be made true in reference to the Y-axis bars. But how do you measure any runout when the 2 bars are 400mm+ apart? Then I remembered "Rollie's dad's method" and wondered if it could help in this situation. As I recalled it, Rollies dad's method involved using 2 long bars resting on the ways which would then seemingly amplify any error and make it plainly visible at the 2 ends of the long bars. So I set the frame upside down (the only long bars I had wouldn't fit in the gap above the 12mm bars) and stuck 2 6ft lengths of 25mm box section on the bars and took a few steps back. (parts magnified for clarity) I set it on the seat to prevent me having to crawl on the ground to "sight" along the bars!! Definitely can see that there is a slight twist to the bars. So I turned up another offset bush to replace a concentric one and tried again. A little better, but not enough, so a 3rd offset bush was made with this result. Much better!! I made up an extension for my digi-vern so I could check the distance between the 2 Y-axis bars and was very pleasantly surprised to find they were only 0.03mm out!! Here's the easy way I made the offset on my mini lathe, just inserted a shim between one jaw and the work. As you can see I have marked the "low" spot on the offset bush, this makes it easy to put a matching mark on the frame so that when re-assembling I can be sure they go back in the right position. 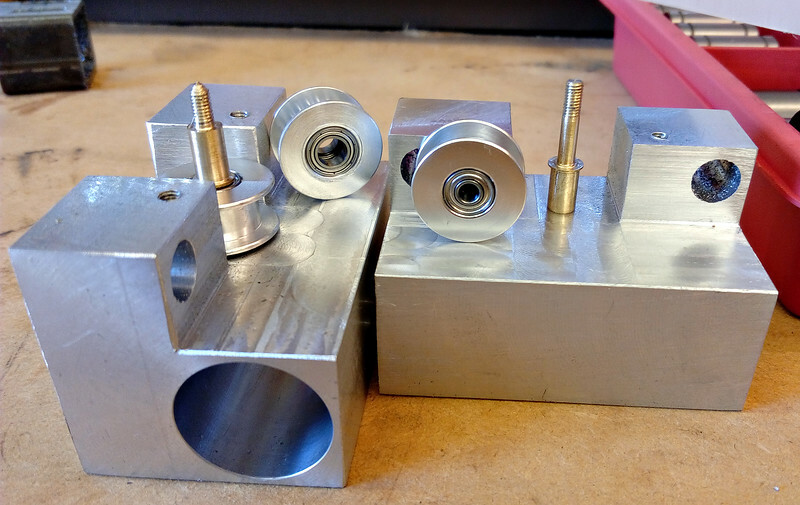 Next up will be working on the Y-axis carriage's, but I gotta order some ali bar for making those. Stay tuned for irregular updates. I did consider it Andrew, but as the error was quite small it actually worked out quicker to knock out a couple of offset bushes. Looks interesting so far, I will be following too. I did think until I read the text properly you was intending to make a monster 3d printer then realised it was that long to check the bars. A little more progress to report. 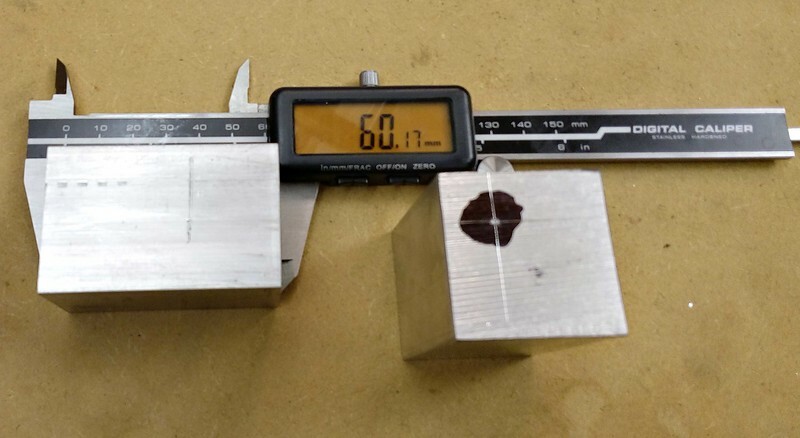 But I acquired a short length of 37mm square ali bar which I hacked off a couple of shorter lengths to make the Y-Axis ( I think ) carriages, and made a centre-pop mark for boring out to accept the 12mm linear bearings. I then mounted it off-centre in the 4-jaw chuck in the lathe. 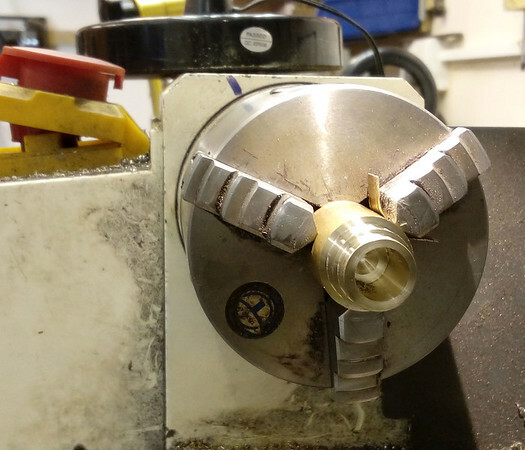 I used a "wiggler" in the tailstock with the point in the centre-pop, then put a DTI on the shaft of the wiggler and adjusted until I had less than 0.1mm runout. Then it was just a case of drilling out to 18mm, then swapping to a boring bar to bore out to a nice tight-sliding fit for the bearings. Then, putting the bearings into both carriages, and sliding a 12mm rod into them I mounted both end-to-end in the mill, supported by the 12mm bar, then skimmed each face in turn to make sure that each face is parallel to the bore. Then I drilled and reamed the 8mm holes for the x-axis bars, which ended up being on 48mm centres, so 40mm between inner edges of the bars. I couldn't help myself and assembled the bits together, it moves really easily with no racking. 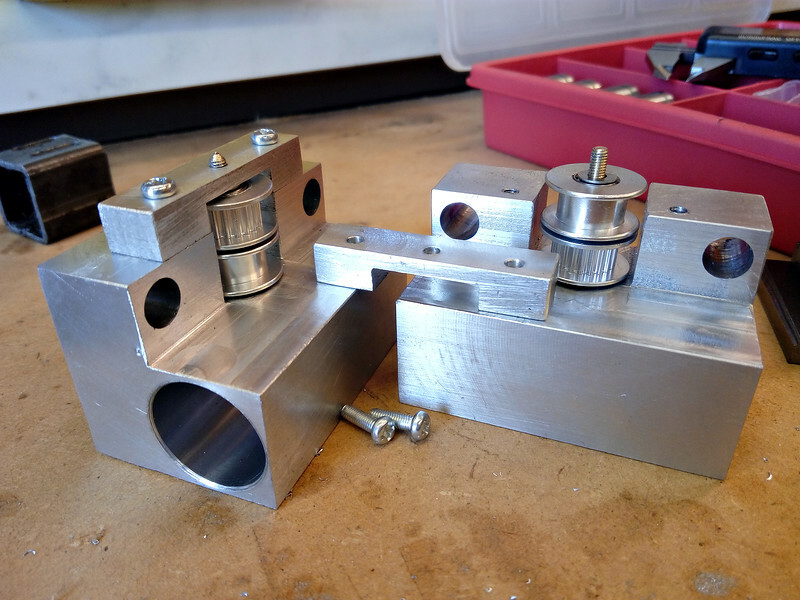 There's still a lot to be done to these y-axis carriages, next up will be milling off some on the underside for mounting idler-pulleys for the belts, and also drilling and tapping some holes for screws to secure the bearings and also the 8mm x-axis bars. Once all the work is done on the y-axis carriages I will see where more material can be milled off to lighten it further. A little more progress made today. I started working on the Y-Carriage blocks to whittle them down a bit for mounting the bearing-pulleys for the belts to run round. 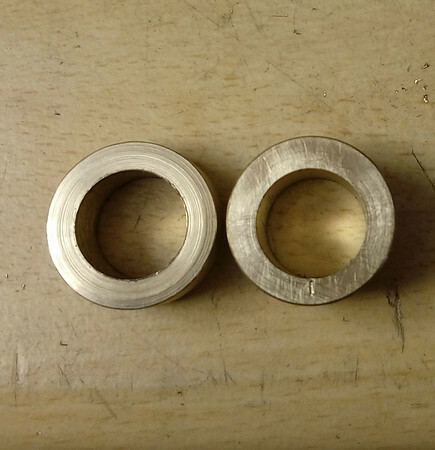 So I milled off a "T" section, drilled for tapping M3 for mounting the bearing-pulleys (the centre hole) and drilled two holes 15mm either side so that I can make a little bracket to fix the top side of the pulleys. I reckon that, compared to the plain Ali' blanks, these are now at least half the weight, and I'm not done yet!! I still have a fair bit more I can mill off, but any major milling will wait until near completion as it gets hard to accurately hold in the vice when you don't have a couple of the original squared faces untouched. Thanks Andrew, solid is what I'm going for. It's a slow build due to limited time in the workshop, but I'm really enjoying the challenge of figuring this out as I go. In my experience (albeit limited), super rigidity isn't particularly necessary for a FDM printer. Vibration and resonance control are far more important and having a rigid all metal frame doesn't automatically eliminate this. In fact it might even make it more difficult to manage. I suspect (but can't prove) that having dis-similar materials in the frame might help break up resonance and might actually be advantageous. The forces and loads on a 3D printer are not really going to stress the frame and joints unless it is really poorly designed and / or put together. I have no doubt that the care and effort you are putting into your project will result in an excellent printer, but I doubt that it will perform any better than a well designed and carefully built printer with plastic joints. I presume building it to your standards is more important to you than rather than just aiming to get a half decent working product in the quickest time possible. 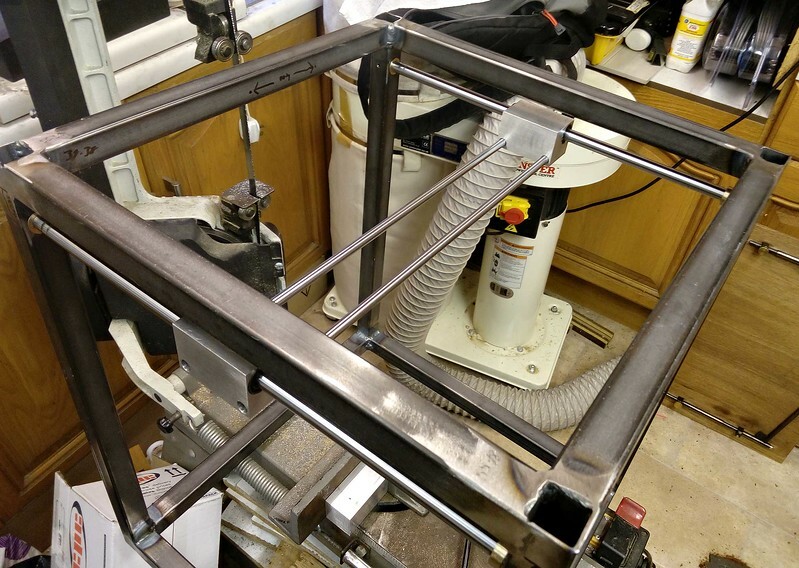 I will be watching your build with interest as I have an ongoing corexy build (aluminium extrusions and aluminium corner brackets) which is currently on the back burner. My problems started with bearing issues. I found that igus drylins had far too much play for my satisfaction and oilite bushes were binding at the slightest hint of dust. I have reluctantly decided to scrap the smooth rods and use linear rails instead but this means a Z axis redesign, which is where I am stuck at. Your thread is a good motivation to pull my finger out and restart my project. How is your Z axis implementation going to be? IMO it is the most challenging part of a corexy design. In my experience (albeit limited), super rigidity isn't particularly necessary for a FDM printer. Vibration and resonance control are far more important and having a rigid all metal frame doesn't automatically eliminate this. In fact it might even make it more difficult to manage. I suspect (but can't prove) that having dis-similar materials in the frame might help break up resonance and might actually be advantageous. The forces and loads on a 3D printer are not really going to stress the frame and joints unless it is really poorly designed and / or put together. A lot of what I am doing is based on the materials I have access to and the techniques I am familiar with, rather than any thought of it being a better way of doing things. You're probably right about the end result being no better in performance than others, especially as even the most flexibly built printers can be run slow enough to not wobble when printing. That's interesting about your bearing issues with the smooth rods, I have seen that many others have moved over to linear bearing rails and blocks instead of smooth rods. I probably would have done that myself if I hadn't already bought the smooth rods and bearings. I'd be interested to see your progress when you restart your project. 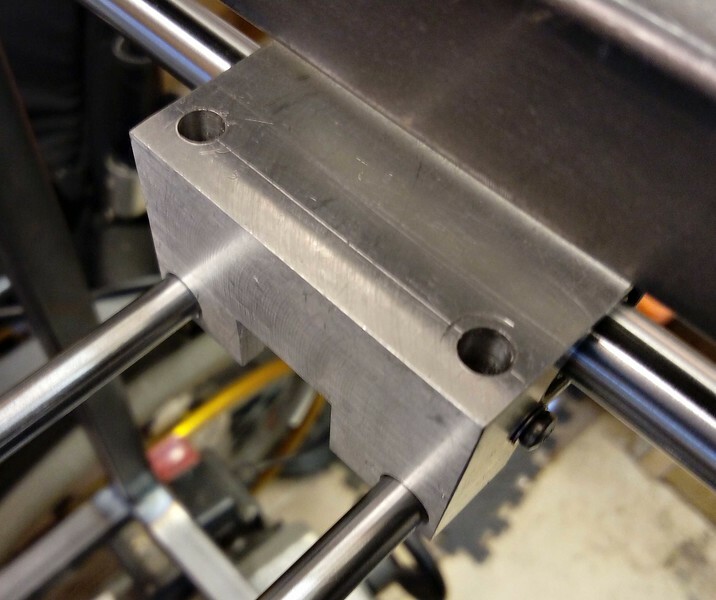 I plan to use 3 8mm smooth rods (1 at each front corner, and the 3rd at the centre of the rear of the print bed) with linear bearings for keeping the printbed from moving in the X or Y axis', and lift will be provided by 3 10mm leadscrews located in roughly the same areas. The 3 leadscrews will be driven by a continuous GT2 belt with one stepper moter. 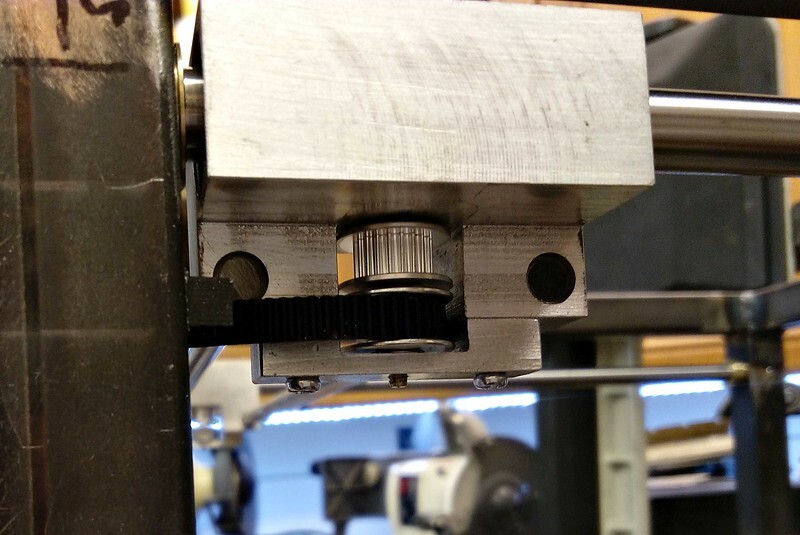 The leadscrew pitch is 2mm, multiplied by 200 steps per rev of the stepper gives a vertical resolution of 0.01mm without resorting to microstepping or "gearing down" using different pulley sizes. Hopefully all of that will give me a printbed that is very stable from movement in X and Y, and also that can be levelled relative to the print-nozzle, and won't sag or bow with weight from the print or from just the weight of the bed itself. Nice work Tim and good approach, I think nrml is pretty spot on with his assessment on resonance. Quite a few comment on my print quality and the fact it only has 8mm rods and plastic carriage components. What they fail to grasp is the fact my print bed is only 150mm square. It's much less inclined to ring like a larger bed, the chassis on this machine is also a welded sheet steel box. Yes you can press the rear like one of those clicker frogs. However in normal operation nothing resonates. If the rear had done I would have glued or riveted a spine across it. Following your build with interest, just flush out the Chinese linear bearings and pack them with a good (LM2) grease every year or so, they will pick up dust and dirt. Same reason I change the belts annually too. I made it out of brass as it was easier, hopefully the forces will not be too much for brass, but I can re-make it out of steel if needed. I will be making a bracket that will fit on top to support the pin, so that will ease the forces applied to the pin. Next up will be the aforementioned bracket. Will you be using a water cooled hot end if you are going to have an enclosed build chamber? I have no doubt that this observation is true to some extent, but I think that it's pretty much the same thing. Bit like flipside of the coin. Good question here is what is good enough and where the error budget goes. There are some little hobby projects I am working and then there are some pretty big machines we build at the work, they have linear rails from 100 mm to 10 metres and nominal sizes of linear rails from 25 to 65 mm and up. Some "axis" are electrohydraulic, some electronic servo system. I may have learnt a thing or two from them. 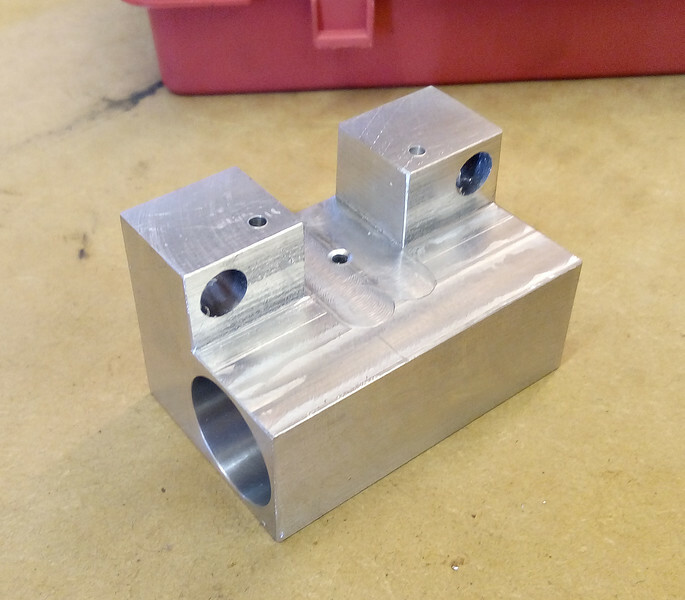 All (steel) frames are flexible, increasing pipe/beam diameter makes structures stiffer and you can make servo loops faster compared to increasing the beam skin thickness. Filling structures with concrete without much attention to some very exotic details is a bad idea. Immovable structures filled with various substances can have very good damping, but it all really "depends" on scale. Sometimes for unseen high frequency dampening internal stringer/plate might do the job, or carefully placed heavy weight highloss mat might do - for some violent shaking (that is not only very obvious to see but it's so hard that rattles your teeth off) might be dampened by loose glass spheres or granules of metal. Sometimes it just best to kill the excitation if you can. Some stuff you really need FEA and accelerometers/impact hammer and megabucks equipment/software. That I see in very many designs. What I'm trying to say here that I definitely see merit here in this design. X/Y axis are very close to each others, which is good. What might be worth of having a look is that when X/Y axis shakes this structure, it will move in relation of the table...worst case scenario is that X/Y axis will excite table and table might move random direction, more than doubling the error. 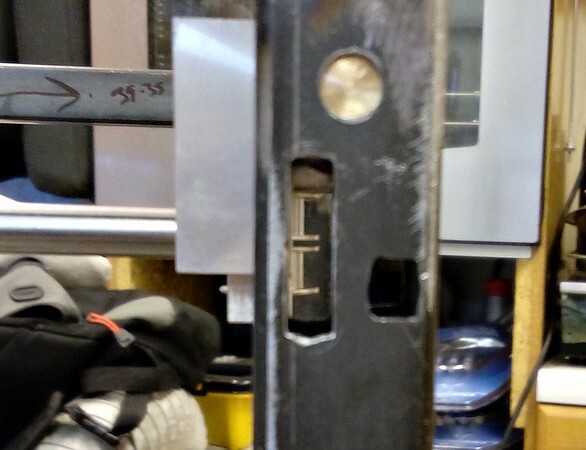 If that comes to play, making frame uprights more rigid, or dampening the coupling into table OR alternatively making coupling into the table more rigid should overcome it. Anyways I think that top of that machine shaking is easier to fix than Abbe error inherent to many design. I haven't decided whether to watercool yet, I like the idea, I'm just not sure how the water-filled tubes will effect the free movement of the print-head, perhaps if I used very flexible (perhaps silicone) tubing? I got the brackets made today, just a couple of 8mm x 10mm x 43mm scraps of ali, with a slot milled in it to accommodate the upper bearing. Not much, but some forward progress. Something like that connected to a little peltier water cooler unit like the ones sold on aliexpress.com and a computer CPU water cooling pump/reservoir would make a really neat water cooled hot end. I am definitely leaning towards water cooling, and can think of some ideas for water-cooling the steppers as well. I like the att. to detail and the high qty of mechanical components You did. The square holes are pretty rough looking, I will tidy them up a bit later when the belt path is more precisely known. I could have got away with making both of the holes the same size (the smaller size), but hey ho, it is what it is. 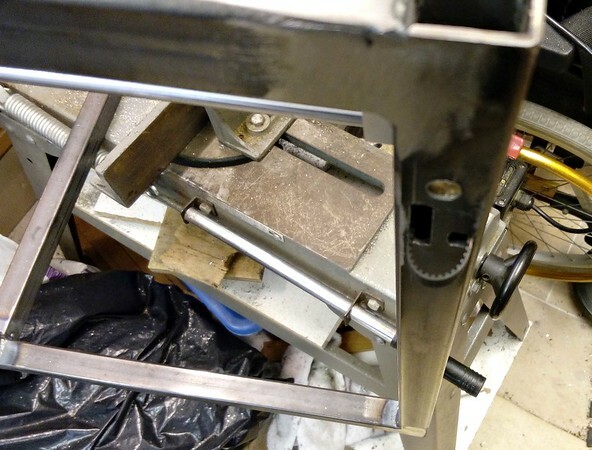 Next up will be drilling and tapping the carriage blocks for grub screws to grip the 8mm x-axis bars, and shortening the same 8mm bars to their proper length. This will allow me to measure precisely the distance between centres of the pulleys of both carriages, then I can make up a bracket to hold the pulleys at the front of the printer frame (for the rest of the belt path). I will probably also drill and tap a couple of holes to stop the 12mm linear bearings from sliding out. Then will be the making of the mounting hardware for the X & Y steppers. I've been thinking about the X & Y resolution, using 200 step stepper motors, and even using 16 tooth pulleys on the steppers, that will give me a full-step resolution of 0.16mm (32 mm of belt movement per rev, divided by 200 steps per rev = ) Using 20 tooth pulleys on the steppers will give me 0.2mm full-step resolution. However, I have had a cunning plan. I have a couple of 36 tooth pulleys, which I could pair with either 20 or 16 tooth pulleys, and make a belt-drive reduction (I also have some short loops of GT2 belt) of either 2.25:1 or 1.8:1. As I have no experience with 3d printers, has anyone any experience with adding belt-reduction "gearing" to increase the resolution? 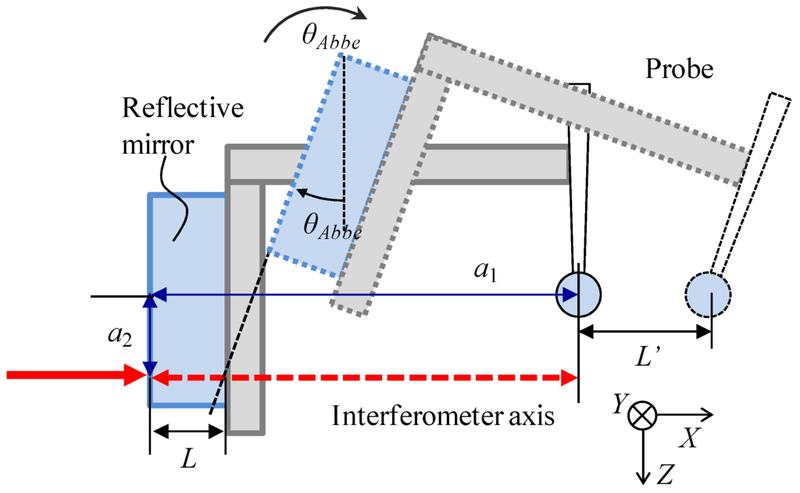 I know about micro-stepping, and I will definitely be using that (primarily to quieten the steppers), but I do know that the individual micro-steps are not exactly evenly spaced between full steps, hence the thought that micro-stepping would not be the most accurate way of increasing resolution. On the other hand, adding a belt-driven reduction may also increase "springy-ness" ( actual scientific term there ) and resonance when abrupt direction changes are made. It certainly will reduce the travel speed by the same factor of reduction, but will also increase the torque. You will be 3D printing covers to tart up those holes. Probably. I would weld them up a bit, but I'm afraid that the welding would cause too much distortion in the frame. Anyways, they will be almost hidden when the whole project is complete and enclosed. This is very interesting thread. I was told " Wet fly - down and across"